sparxmind wishes to see more ice cream vending machines. I’ll take it one step further. 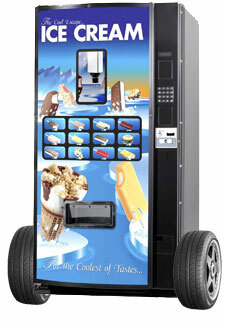 I want self-driving, automated ice cream vending machines on wheels. Naturally, this will put ice cream truck drivers out of business. This saddens me; for my career plan as a first grader was to grow up to be an ice cream truck driver. However, consumers will benefit. Kids and parents won’t have to pay the premium prices associated with ice cream truck costs (driver pay, gas to haul truck around). My siblings and I learned at a very early age that ice cream trucks are a rip off and that we usually had ice cream in the freezer. Also, these vending machines could have routine programmed patterns so they may travel throughout an office building. Instead of walking to the vending machine, the vending machine will come to you. are you talking about robotic ice cream machines that travel through the office at random times? Wow. That would be cool. There goes the ice cream office truck. yea, a robotic ice cream machine that travels through the office. Will this robotic ice cream machine also serve coffee?